I was reading Edward Nankivell's Stamp Collecting As a Pastime recently. The work was published in 1902, and it would be something of an understatement to say that some of his advice is outdated, but since I never mind reading (or giving) outdated advice, this presented no problem for me. 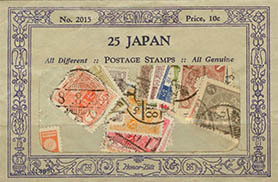 Nankivell suggests that most new stamp collectors start off as generalists before choosing a specialty, which has never been a bad idea, and goes on to state that, "The beginner will find that he can fill up a large proportion of the spaces in his album with comparatively common stamps, and these are much more economically purchased in the form of cheap packets." "Cheap," of course, is a relative term, but building one's collection through the purchase of stamp packets was definitely the way to go when I was a lad. Back then, stamp packets - the kind that said something like "200 Worldwide, All Different" - were not so difficult to find. Woolworth's and Kresge's (the dime store chain that eventually became Kmart) both had stamp departments, with inexpensive albums and stamp packets. Most of the albums and packets back then were furnished by the H.E. Harris Co., which had a virtual lock on the lower end of the philately market. Some department stores also had a stamp department in those days, and the offerings there were a bit more upscale. I very clearly remember my mother taking me to one of those establishments in Providence, Rhode Island, and purchasing a large packet of German stamps for me. What I had done to earn such a treasure remains a mystery to me, and whatever it was apparently occurred only once, but the sheer delight of having been so indulged still happily echoes in my memory many years later. It was a BIG packet. How big, I cannot say, because that detail is lost to time. Sometimes I think it might have been 300 different German stamps, sometimes 500, but whatever it was, it was a king's ransom to me, and I was quite sure I would never want or need anything else for the rest of my life. Stamp packets are not so easy to find these days. There aren't really any true "five-and-dime" stores left, and department stores no longer cater to budding philatelists. But stamp packets can be found on the internet, so that's something.